The significance of the Haven Estuary of the Rivers Stour and Orwell as a military and commercial port has been well documented by historians. Over the centuries the low, estuarine landscape between Felixstowe and Harwich has provided a sheltered anchorage surrounded by a gently rising shore with a generally flat hinterland. As well as providing a natural harbour the Haven presented a great opportunity to an invading army to land, secure a beach-head and progress rapidly inland through Essex to London, the heart of the Nation. The importance of the Haven was recognised by the Romans who by 300 AD had built a castle at Walton, north of Felixstowe. The Danes regularly used the harbour and were defeated by King Alfred's Navy at Bloody Point, Shotley in 885. Undeterred, they landed a force in the Haven in 991 before the sacking of Ipswich. In 1016, Canute used the Haven on his way to take the English throne. Attacks on the Haven continued for almost the next 1000 years. Between 1320 and 1470 Harwich was attacked seven times, chiefly by the French and Dutch and the port was used as an assembly point for English Fleets, notably before Sluys in 1340 under Edward III. Threats to the East Coast continued as the turbulent politics of Europe ebbed and flowed through the Napoleonic War up until the Second World War. The significance of the Haven as a strategically important port and its vulnerability to attack resulted in the construction of a complex infrastructure of defence works, from the Brackenbury Battery north of Felixstowe to Beacon Hill on the seaward side of the Harwich Penninsula (see Map 1). The full history of these fortifications is complex and is well documented elsewhere. However, it is important to acknowledge here, that large elements of these fortifications survive as an important testament to the Haven's rich maritime history. 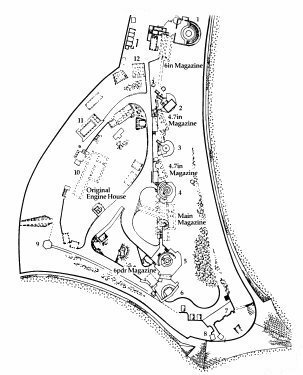 One important surviving remnant of the Haven fortifications is located at Beacon Hill, Harwich (see Map 2). This promontory provides a good vantage point over the coast and inland and has therefore been recognised as an important defensive site for many centuries, indeed archaeological finds suggest that the site was occupied as early as the Bronze Age. Beacon Hill is only a component of the defensive structures which were established in Harwich over the years. The Redoubt which is located approx 100 metres North West of the Beacon Hill site is a circular fort built in Napoleonic times as a counter to possible French invasion has been considerably restored by the efforts of The Harwich Society. Other defensive sites existed at Harwich but in the main they have been lost over the years to re-development. The Beacon Hill Battery constructed in 1889/90, expressed a radical new tactical doctrine in coastal defence: this substituted the idea of 'invisibility' from an earlier ethos of visible, almost monumental defences. An example of the latter may be seen in the high granite facade of Landguard Fort at Felixstowe, finished just a decade before. The rationale for this change in approach was an improvement in the accuracy, power and range of naval armaments which made defences constructed in the manner of Landguard Fort more vulnerable to bombardment and destruction. On the other hand, a battery which was absorbed into a landscape, either real or apparent, was less vulnerable because a fort which was difficult to see was also difficult to hit. 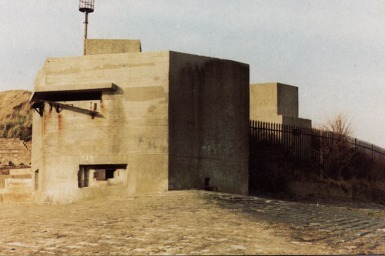 However the battery as it exists today represents a line of visible concrete structures, reflecting a requirement in the Second World War for an elevated fire control position and for the enclosing of the gun positions in casements to protect against air attack. The loss of invisibility which resulted was the price to be paid for responding to new tactical circumstances. Map 4 shows the principal structures in some detail. The original battery was possibly the first to employ the new doctrine of invisibility in a coastal defence setting. On the seaward side, its one 10-in. and one Gin. breech-loading guns were mounted on disappearing carriages in pits: the barrels sprang up above the pits for a few seconds to fire and then recoiled back down out of sight for reloading (see illustrations). Two 4.7-in. and two 3-pr. Quick--firing guns were also mounted behind ultra low-profile apron- parapets hardly visible at any distance. On the landward side of the fort, the battery was provided with defences in the form of the revolutionary Twydall Profile, invented just a few years before and incorporated into a coastal defence for the first time at Beacon Hill. This was a gently sloping glacis down to the bottom of a ditch containing a concealed unclimable fence. A large concrete lined dug-out close by was used as a bombardment shelter and the rear defence troops would have rushed out of this at the appropriate moment to line the parapet and fire with their magazine rifles on any enemy infantry assault launched by a landing force. In the centre of the battery was a low artificial hill which provided an apparently natural back-drop to the guns and concealed from view the engine rooms, magazines and other accommodation enclosed within it. It also screened the rear of the guns and the backs of the gunners from fire from the landward side. 4.6 As constructed, the battery was undeniably a revolutionary way forward and, indeed, was the prototype for other batteries built both in Britain and abroad in the 1890s. At Beacon Hill, traces of the original emplacements may be seen beneath or next to later modifications. Some of the original magazines also exist as well as much of the rear defences and the concrete lined dugout and other positions. 1. First World War bin gun emplacement reinforced with Second World War concrete. 2. Base observation post (Control Tower) built on top of First World War gun emplacement. 3. I're First World War gun emplacement circa 1900. 4. First World War gun emplacement with Second World War additions. 5. First World War bin gun emplacements with Second World War additions. 6. Second World War twin 6 PIER guns with own BOP. 7. Battery of about 1860. 9. Second World War pillbox Underground Structures. 10. First World War underground workshops. 11. First World War generator room. 12. First World War guard room. All three 6-in. guns were roofed over against air attack in 1940 and, by 1942 a large case mate known as Cornwallis Battery, armed with a twin 6 pounder quick firing gun with its tall overhead fire director tower, had been added on the right flank. The monolithic fire control tower was added in the centre of the battery front. In 1940 a radar tower was built on the left flank of the battery. This still exists, although its structure has suffered cracking in one corner from subsidence. The rebuilding and modifications of the Second World War did most to give the battery the appearance which it has today. Thus from start to finish the Beacon Hill Battery was originated and developed in response to the interaction between technical advances in weapons, and political tensions, with the periodic threats of raids or invasion. Like many other batteries, the Beacon Hill Battery went into "reduced" status after 1945, although it was still considered an active defence. The battery was abandoned after 1956 when it was claimed by the War Office that improvements in military jet aircraft and the advent of guided missiles had rendered coastal defenses obsolete. Because of its origins, the battery has a greater than just local historical importance as a milestone in the development of fortifications. Its Twydall Profile and the shelter are probably the earliest surviving in the country. The Second World War structures at Beacon Hill have an important regional historical importance. In the whole of the southern coastline of the county of Kent for example, no complete battery form this period has survived intact except add-one on Dover's Western Heights due to demolition both by private owners and, sadly, by public authorities in the 1970's and early 1980's. The danger of such destruction in other areas is always a risk and the Beacon Hill Battery assumes an ever greater importance as a result. Its radar tower with some of the internal aerial array still surviving, has an importance on its own account, being one of the earliest radar emplacements in the country. The site is rare in that all the aspects of a battery: gun emplacements, radar, fire control, magazines, engine rooms and searchlight emplacements are concentrated within a relatively compact area. The site presents a unique opportunity to display all the aspects of a twentieth century coastal battery in one place. The District Council is fortunate to have this site within its boundaries and this places a custodial responsibility on its owners to preserve its visual integrity and to facilitate its presentation to the public. If you stand on Beacon Hill battery and look north across the harbour to the granite casemated face of Landguard Fort and compare it with the battery you are standing on, built only ten years after the latter was finished, you may well wonder whether the Royal Engineers had taken leave of their senses, or what had happened to require such a radical change in design. A great change had indeed taken place in the military world. Military technology was forcing back the frontiers of science and engineering as fast then as it is today. In 1878 navies and coastal guns expected to fight at 2-3000 yards maximum. The largest guns at Landguard were 12.5-inch rifled muzzle loaders of 38-ton weight well capable of taking on the best battleships of their day. By 1888 battleships, not even the best, could pulverise forts like Landguard with breach-loading guns at ranges the R M Ls could not reach. On land the Turks at Plevna in 1877, armed with modern rifles and firing from dugouts, had amazed the military world by decimating the Russian hoards. In Britain the first magazine rifle, the .303 Lee Metford, was approved in 1888. In 1882, at the bombardment of Alexandria, apparently weak Egyptian forts built in the sand dunes had been able to absorb a large percentage of the British bombardment, due to the ability of the sand to deflect shells away from their target. The difficulty of identifying the precise position of the Egyptian guns was also noted. Firing trials were carried out at Portland in 1885 by HMS Hercules against a 6-inch gun mounted on a disappearing carriage. Despite closing the range and using even her smallest guns HMS Hercules was quite unable to hit the target. At Harwich something had to be done to protect the fourth most important naval harbour in Britain which was at the same time a prime target for an invasion force. The Stanhope Commission of 1887 proposed two batteries of breech-loading guns. One at Landguard and the other at Beacon Hill to cover the approaches to Harwich. Money was allocated in the imperial defence loan of 1888 and work started at once. Beacon Hill posed special problems to the engineer designers for, being isolated from the main garrison at Landguard, it required its own land defences. Being the first of its kind built in Britain the site provided an opportunity to test new designs and ideas and absorb the lessons of modern warfare; in fact, it was to be the prototype for coastal defence batteries to be built at home and overseas during the next ten years. The main armament was to be one 10-inch breech-loader and one 6-inch breech-loader mounted on hydro-pneumatic disappearing mountings. These mountings allowed the guns to disappear under ground to be loaded, only appearing for twenty seconds to fire. Gun and mounting were enclosed in a mass of concrete with an apron of sand in front to absorb or deflect enemy shells. The supporting armament were two 4.7-inch QF guns and two 3-par. QF guns the first to take on enemy small craft and the second to stop a landing by enemy marines and support the infantry defence on land. Camouflage for the guns was provided by leaving the sea face of Beacon Hill in a natural state and building the centre to provide a background. This artificial hill did not just form a back drop to the guns; it protected the gunners' backs from fire from the land front and it housed the engine room and a dugout for the defending infantry force. It helped camouflage these infantry whose duty it was to defend the land front and its crest line is nicely judged to allow the 4.7-inch guns to turn round and just fire over this crest to support the infantry defence. On the land front, the engineers built what is called a Twydall Profile. That is a glacis sloping gently down to the bottom of a ditch thirty yards in front, containing an eight-foot unclimbable fence. On the outside of the fence the bank of the ditch rose sharply to protect and hide the fence, then the glacis continued to slope away across the sports field to Barrack Road. This Profile was specially designed to provide the defending infantry with the best conditions in which to use their new magazine rifles. They could retreat to the dugout when being shelled and re-emerge to man the fire step as the enemy infantry attacked across open ground. The entrance gate of Beacon Hill, being a vulnerable point, faces the Redoubt, at that time armed with machine guns and 68-par. SB on the land side. Construction work began on 10 January 1889 and the battery was substantially complete by 30 September 1890. 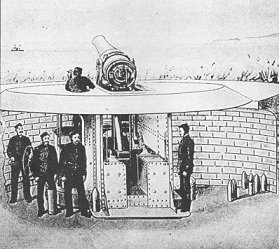 On 5 March 1890 the first trials in the United Kingdom were carried out on the 10-inch BL gun fitted to an Armstrong HPDS mounting firing 500 lb. shells propelled by 252 Ibs. of prismatic brown gunpowder. In about 1543 a blockhouse had been built on Beacon Hill, but it had limited life and the hill was refortified at the time of the Armada being joined to the town walls by an entrenchment. Plans show no further defence works until 1812, although a small fort was planned in 1709. In 1812 a battery was built at the tip for five 12-pars. but it was destroyed by sea erosion by 1822. A replacement battery was proposed by Col. Tylden in 1839 and some sort of fortification is shown on the plans of 1866. In 1871 a practice battery replaced this, facing south across Mill Bay and continued to be used until about 1894 when it was replaced by a further practice battery of three 64-pdr. R M L.
On 6 September 1888 authority was given to build on the new battery at Beacon Hill, to be armed with a 10-inch BL and a 6-inch BL on HP carriages. Work started on 10 January 1889 and was substantially complete by 30 September 1890 by which time two 4.7-inch had been added to the armament. Their emplacements being finally completed by 15 May 1892. The 6-inch and 10-inch guns were mounted on Elswick pattern HP mountings. The 10-inch gun arrived on 21 September 1889 and fired its trials on 5 March 1890. Forty-seven rounds were fired, the mountings being found to be satisfactory and accepted into service. The gun barrel was then removed to Landguard for trials and a fresh barrel delivered on 3 October 1891. This mounting appears to have been entirely satisfactory throughout its life. The armament was completed with two 3-pars. initially on carriages but with purpose-built mountings from 21 January 1898. This page was based around extracts from the publication "Beacon Hill Ancient Monument - Draft Action and Managment Plan" (Nov 1989) With the permission of R.Colley, Head of Planning & Building services, Tendring District Council.